Along phylogenetic evolution, animals have developed efferent neural pathways able to modulate their sensory systems, presumably to enhance or attenuate sensory stimuli with relative biological significance. 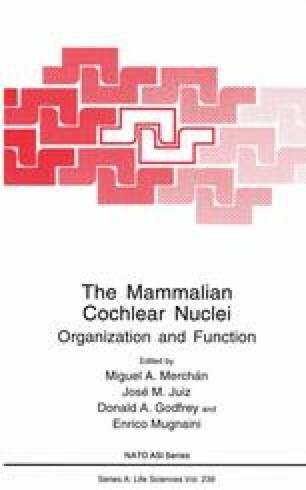 In the case of mammalian hearing, acoustic information can be modulated at two levels, the periphery and the central nervous system. The peripheral control is carried out by movement of the pinnae, muscles of the middle ear, and by efferent neurons of the olivocochlear systems that innervate the organ of Corti. The central control is carried out by efferent or descending auditory pathways that parallel the ascending auditory pathways. In general, the descending pathways have received little attention compared to the ascending pathways. Although for many years the descending auditory pathways were considered far more simple than the ascending pathways, recent studies are beginning to unravel the complexity of the descending systems and their functions, and the unexpected intricacy of their topographic organization (reviewed by Huffman and Henson,’90; Spangler and Warr,’ 91; Warr,’ 92).